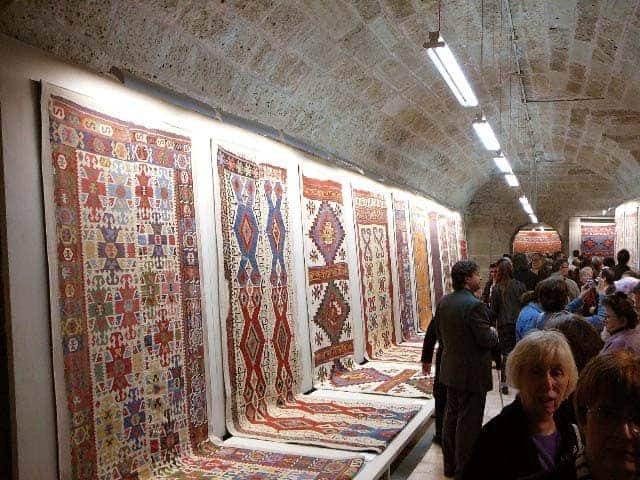 Archive photo: Kilims from the Vakiflar Kilim Museum exhibited during ICOC Istanbul 2007. Photo courtesy Jeff Krauss. This years Istanbul Carpet Week will take place Thursday 25 October to Sunday 28 October 2018. The event includes Istanbul Rug Show, Istanbul International Carpet Conference, The 12th National Carpet Design Contest and also a reception and exhibition of Anatolian kilims from Vakiflar Kilim Museum at the newly restored Istanbul Carpet Museum. Istanbul Carpet Week is organized by the Istanbul Carpet Exporters Association with Hali og Cover magazines as media partners. The lectures at the carpet conference includes ‘Divrigi Mosque Carpets’ by Belkis Balpinar, ‘Kilims of the Vakiflar Museum Collection’ by Suzan Bayraktaroglu, ‘Future Thinking: Design and Interiors’ by Lucy Upward, ‘Turkish Carpets’ in Italy by Alberto Boralevi, ‘Anatolian Carpets in the Western World: A Story of Mutual Influences over the Ages’ by Ali Riza Tuna and ‘Keeping the Art of Design in a Digital Age ‘ by Erika Kurtz.